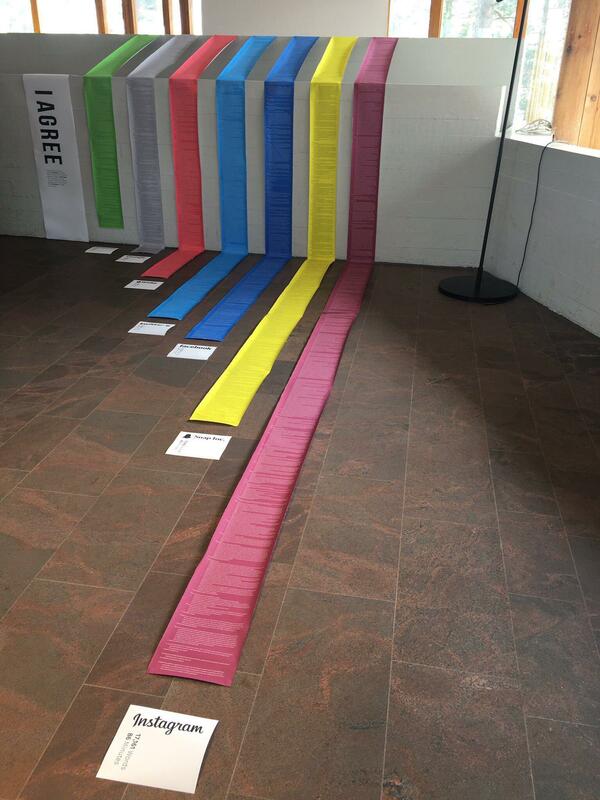 "I Agree" is a Dima Yarovinsky's art installation for Visualizing Knowledge 2018, with printouts of the terms of service for common apps on scrolls of colored paper, creating a bar chart of the fine print that neither you, nor anyone else in the history of the world, has ever read. Thanks to Nightpool for identifying the work and its creator! I wish I knew more about this! The associated Reddit thread doesn't have any detail on the creator, date, or context, and of course, searching for "i agree terms of service gallery" just gives you the terms of service for a bunch of art galleries. If you know who the artist was and where this was exhibited, please leave a comment below.